TreasureBox - Make Every Dollar Count! We are a team of someone who love sleep just like you. If you’re ever woken up from a bad night’s sleep with a stiff neck, you’ll know what it does to your energy levels and well being. Our popular Memory Foam Pillow has been specially designed to deliver an excellent night’s sleep by providing neck support exactly where you need it. The high-quality memory foam will mold itself to the contours of your neck and head while you sleep, but will spring back to its original shape as soon as you lift your head from the pillow. 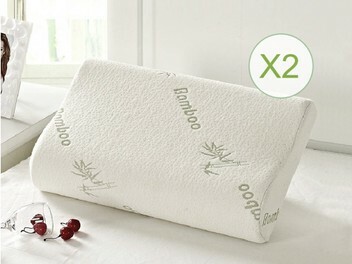 What's more, the bamboo cover allows air to circulate through the pillow and keeps you cooler as you sleep! Sleep more deeply and wake up with less pain and stiffness!